Terminate will clean up after the crashed app but otherwise does nothing further. Debug will start the Debugger for further investigation. Write core file creates a possibly huge dump of the system's state. Better attach a regular debug report first when submitting a bug report and only provide a core file on request. Save report creates a debug report which is saved as a text file on the Desktop and can be emailed to the developer of the crashed app or attached to a ticket at its bugtracker, if available. The debug report contains information on your hardware (type of CPU and used memory etc. ), the exact version of Haiku and all available information on the state of the system that could be relevant to the crash. The default action when a crash happens can be configured with a text file ~/config/settings/system/debug_server/settings. user Prompt the user for action. kill Silently terminate the crashing team. debug Attach the debugger to the crashing team. log / report Save a crash report and terminate the team. core Save a (possibly very large) core file and terminate the team. If no default_action is specified, "user" is assumed. The executable_actions subsection contains individual overrides of the default. These take the form above, where the individual lines can be only a team name, or a path, with wildcards. As you'll quickly see when you start poking around a bit, the Debugger is one of the most complex and sophisticated applications for Haiku. If you're a developer and are used to graphical debuggers on other platforms, many features will be familiar to you. 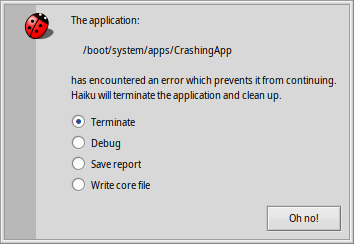 Below are a few links that may shed some light on the intricacies of Haiku's Debugger. If you have a specific question, you may want to consider posting it on the development mailing list. If you find more useful resources, please file a bugreport with that info. Debugger Reference Manual This is the most in-depth source on how to work with the Debugger. 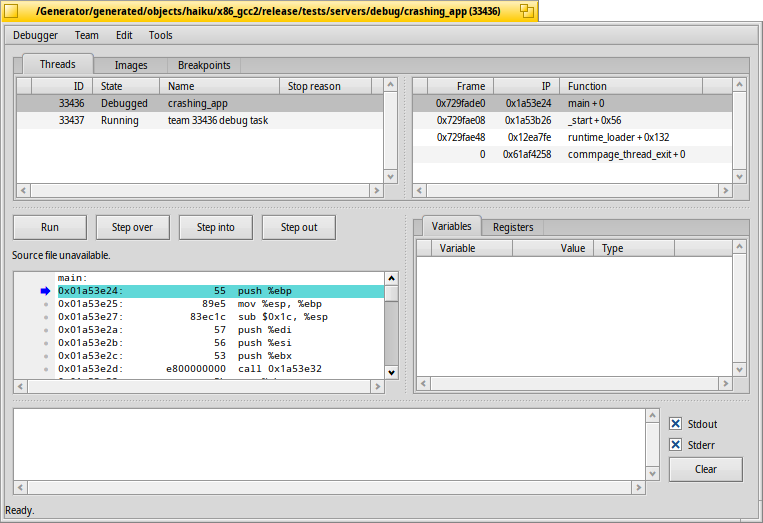 Blogposts There are a few articles on the Debugger, mostly by Rene Gollent after implementing a new feature. BeGeistert 026 video A video from the BeGeistert meeting in 2012, in which Ingo Weinhold demonstrates the state of the Debugger back then and shows other interesting tools like the profiler to hunt down bottlenecks.